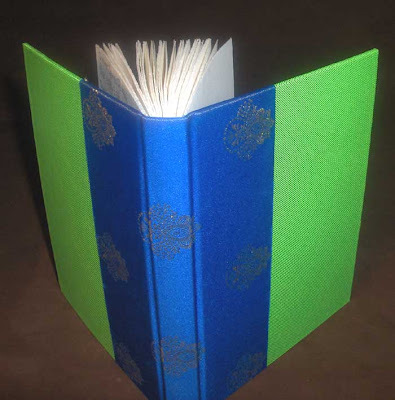 LadyArtisan, also known as Eva, submitted this Summer Sparkle journal for our book swap. Just a tiny bit difficult to photograph the shiny fabrics on the cover! Eva says this is one of the first cloth-covered, cased-in books that she has done. 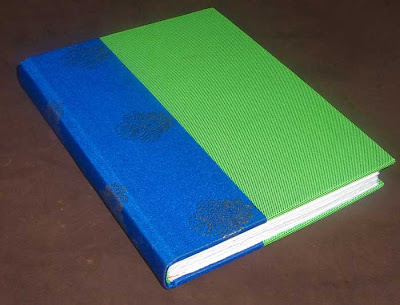 It has green lamé on the covers and a satiny royal blue fabric with gold medallions along the spine. The look and feel of these fabrics is not fully eveident in these photographs, it is really a glitzy shimmery book. Visit LadyArtisan.Etsy.com to see more of Eva's work. Thank you, Eva! I am the lucky recipient of your summer sparkle book. I love it! The photograph does not do it justice. The two fabrics that you chose complement each other beautifully. I have only worked with cotton and canvas. I imagine the lame was quite slippery. Thanks for the book.